For some time, I’ve disliked the way the idea of “generations” has been treated by the culture at large. Not the nugget of thought that’s in it, that cohorts of people in a particular time and place will share certain experiences, some of which will shape their outlook—but the nutty, pseudo-scientific way it’s been used. The balderdash that’s been added to “generations” includes the nonsense that there are some sharp and agreed on borders to them and that everyone inside of these sharp lines in time not only shares the same experience, but reacts to these things in the same way. The crap labels we use like “Generation X” (Billy Idol and Richard Hell may have a lot to answer for, but let’s not hang this on them) or “Millennials,” (who could just as well be perennial grinders of grain for all the meaning I assign to that word) have become like unto the Sixties’ penchant for astrological signs. “Oh, you’re so Millennial” or “Members of Gen X think this way” have become the Moonchildren and Fire Signs of our age. And of course, the borders of these deterministic generation containers are natural and inviolate—no, don’t look at them, as they will seem arbitrary and varied if you look too close. Are generations 12, 20, 30 years long? Don’t ask, as we don’t agree. And is someone born in 1946 exposed to the same set of experiences as someone born in 1963? Don’t look too close. I bring this up, because this week I wrote a parody. And as humorists have been known to do, I went and used some generational stereotypes. I was pressed for time, those sorts of things are ready-mades, one or two people found it funny, if I use it humorously I’m making fun of it—Oh, I’m giving up. I’m ashamed. New start. I had a serious thought as I started this. Earlier this month I revisited the well-known yet too-little-reconsidered Robert Frost poem “Stopping by a Woods on a Snowy Evening.” As I thought about the experience Robert Frost was describing (if an actual country winter buggy ride, some think it occurred in 1909), I considered how different the night and the rural roadscape would have been then, compared to how we have informally remembered Frost’s poem. I thought the opening stanza of that poem, starting with Frost’s line that’s fallen into too-famous-to-think-about status: “Whose woods these are, I think I know,” could be describing a person who was lost in a darkening, rural pre-electric light, night—instead of a poet some of us remember as irresponsibly stopping to look at a well-lit Christmas-card pretty sight of a woods in snowfall. And then I thought again about that phone. There are still areas, even in North America, without cellphone service. GPS signals don’t penetrate everywhere. Those maps in our apps are not without errors. Drake’s from Canada, but Minnesota and New England need cell coverage and warm coats too. 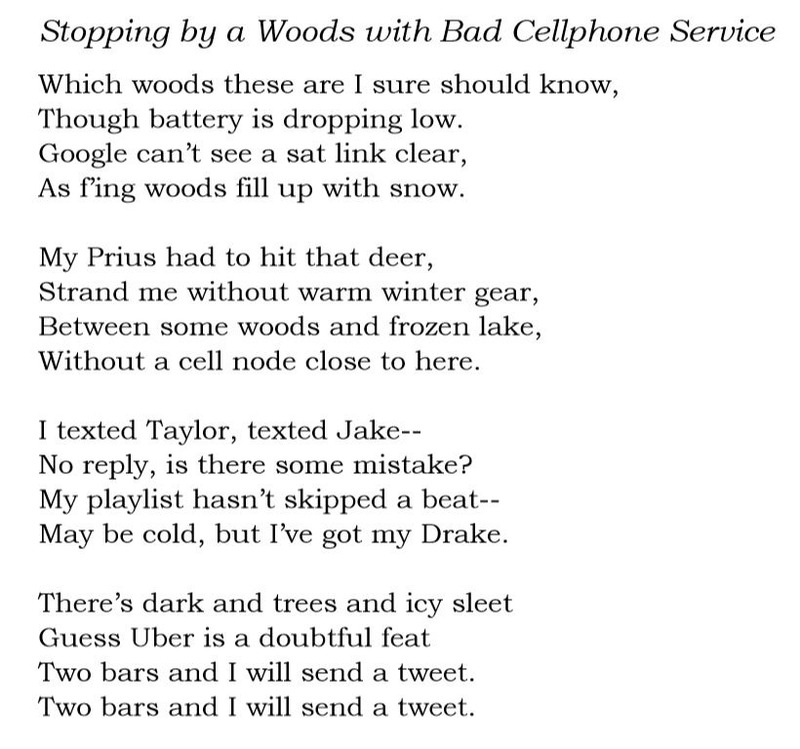 So, today’s piece, which I call “Stopping by a Woods with Bad Cellphone Service” is actually a serious piece of winter travel safety advice, not a scurrilous piece of generational stereotyping, which I would never stoop to doing here. Here are today’s words, but you want to listen to the music don’t you? But when you think of scurrilous, I hope you think of the LYL Band. It’s been awhile since I’ve had a piece that wasn’t created by that scrupulous and well-behaved group of musicians that is myself—recording it instrument by instrument, a track at a time. The LYL Band is an organization in the same way that a hockey fight or litter of kittens is organized, which is to say, barely, though we attack things with abandon playfully or otherwise. To hear us, use the player below.